Ford has filed a new patent that shows a V8 engine with two electric motors aided by a pair of batteries.More interestingly, a future, high-performance Mustang with all-wheel drive. First the patent was uncovered by AutoGuide. 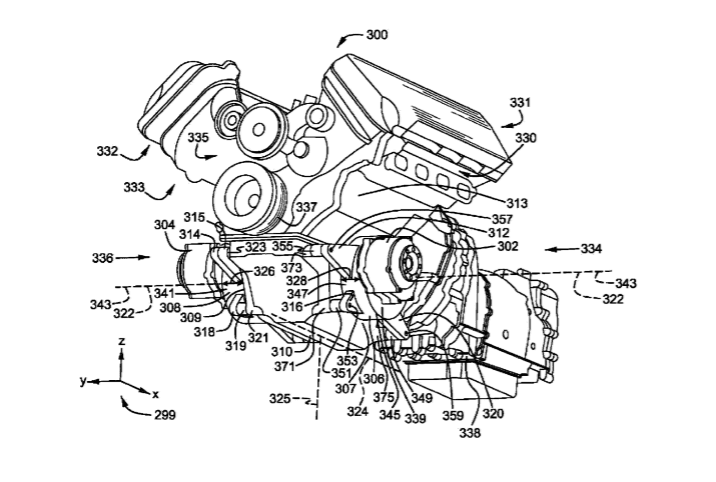 It was filed by Ford in July 2017 but not published until January 2019, and only recently published to the U.S. Patent and Trademark Office website this week .The patent for a “twin motor drive system for a hybrid vehicle” features a V8 engine and two electric motors. According to the patent,the internal combustion engine spins the rear wheels, while the two electric motors each powering one of the front wheels via a reduction gearbox mounted on the front, effectively granting the vehicle electrified all-wheel drive. In April 2018, Ford announced that Mustang hybrid would boast V8 power with more low-end torque.Other than giving vehicles a lot of power the twin motor drive system would enable them to have a compact all-wheel drive system. As Ford explained in the patent that traditional AWD vehicles use a transfer case to distribute power to all four wheels. Despite that, vehicles that have a small amount of space for drivetrain components, wrapping the components of an AWD system may be difficult. As a result, Ford has developed this new powertrain which has significant packaging benefits over traditional AWD systems. The patent also shows the engine could be equipped with an integrated starter motor/generator. Ford says this would help to produce electricity for motors while also reducing the electrical load on a vehicle’s battery or batteries.